It's now the start of a new year, a time when people return to work after reflecting on the previous year while making resolutions for the future. One man, Bob Arum, returned to work cherishing the gift he received shortly before Christmas, the news of a 90-day jail sentence for Floyd Mayweather, which many believed would force the delay of the much anticipated Mayweather vs. Pacquiao bout. This gift seemingly gave Arum the freedom to pursue his original plans of securing another opponent for his prized asset, all the while maximizing his own profit without any outside interference. In a stunning twist, however, Mayweather's incarceration was postponed Friday evening when his attorneys requested a delayed surrender date to allow him to fulfill his prior commitment to fight on May 5. With the judge granting the request, one would think that would reopen the possibility for the Mayweather vs. Pacquiao bout to actually take place. Arum, however, disagreed, making it clear that the news will not change his plans to provide a list of four select opponents, none of them being Mayweather, for Pacquiao to choose from next week. The question is, which one will Team Pacquiao choose? Pacquiao's performance in his bout with Marquez has taken away the perception of invincibility he's had since his victory over Oscar De La Hoya. Knowing that he is beatable, does this leave the door open for another tough matchup, or was there enough element of worry there for Top Rank and Team Pacquiao to wrap their man in cotton wool with a carefully matched opponent? It is well documented that there may be a split between Top Rank and Miguel Cotto, so a promised rematch with Pacquiao may be an attempt to keep Cotto signed to the promotional company. The bout is rumoured to be, once again, at a catchweight, but this time, north of the welterweight division, as Cotto now operates impressively at 154. Cotto feels he has been given rough treatment in the past with negotiations, in particular the previous bout with Pacquaio in which he had to agree to weigh in at 145. Considering that Pacquaio previously fought Antonio Margarito, who Cotto just defeated, at a catchweight of 150 pounds, it should be no problem for the Puerto Rican star to get the Filipino sensation to once again meet him halfway, this time at a weight where Cotto won't be draining himself. Cotto, at a more comfortable weight, will give Pacquiao a lot more problems, and from a business perspective, the fight would do excellent numbers. Bradley recently signed with Top Rank, so he will have very little authority in the negotiations, which suits Arum and Team Pacquiao just fine. Bradley has indicated he would like to remain in the 140-pound division for a little while longer, but has expressed his desire to step in the ring with Pacquaio. As it stands now, Bradley doesn't exactly have the biggest following yet and is still convincing people he is a top level fighter, especially after a disruptive 2011. I, however, am very much of the opinion that Bradley is a top level fighter and his style could really cause Pacquaio problems. Bradley is a fresh, young fighter, and his ability to adjust well during a fight could really make it an awkward night for Pacquaio. That being said, Bradley has been dropped before and has not faced anybody with the speed or punching power of Pacquiao, so that really creates a huge element of doubt that Bradley will survive with Pacquiao. 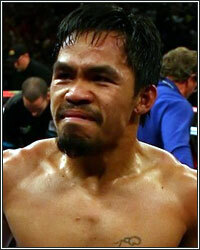 After Pacquiao's two previous performances, a lot of people are questioning if he maybe he is past his best. I am of a different opinion and believe that his previous two opponents simply worked out a game plan to really frustrate him. I think Bradley could do the same and would be very shocked if this fight was the next business at hand for Pacquiao. Bradley's style could prove awkward, and I do not feel as if he is a big enough draw just yet. The only reason it is being considered is because of the Top Rank connection, which will ensure the money stays in house. The thorn in the side of Pacquaio. Three fights, three controversial decisions, so does this warrant a fourth fight? Team Pacquaio and Top Rank are so fond of telling everybody how their man won all three fights. If that is the case and you are so convinced your man won, why fight a fourth time? The look of anguish on Pacquiao's face at the end of the bout, along with the concern in the corner during the fight, told its own story. So why was Bob Arum's accouncement of a fourth fight in May so hurried during the post-fight interview? was it because he realized it was a robbery? Was it a way of avoiding talks of putting Pacquiao in with Mayweather? Of was it simply because he feels he can maximize profits? My guess is probably all three, and after hearing explanations like, "Pacquaio landed more punches" (when in the previous two fights Marquez did the same comfortably), "Pacquaio cramped up after round 4" (Pacquiao appeared to move better after round 4), and "Marquez kept stepping on Pacquaio's feet and head-butted him" (regular occurences in an orthodox vs. southpaw matchup), I'm not so sure I want to see a fourth fight, fifth fight, or twenty-fifth fight between the two, as we will only get the same result with the same excuses. However, with Arum making no effort to pursue the Mayweather bout, it would make good business sense to face Marquez again considering the controversy, as well as the financial success they had, in the third bout. I personally don't see what winning a fourth fight would do for Pacquiao's credibility since, after all, he "won" the first three, right? Besides, winning a fourth fight will still not change people's minds on the first three fights, and any fighter that beats an opponent who is 38 years of age will always hear the "he is too old" line, so it's really a no-win situation if you take the money out of the equation. I had to laugh to myself when I first saw Peterson being mentioned as a possibility, as this choice would not surprise me at all. He's the sort of opponent that Team Pacquiao would love to see their man face, as his style is perfectly matched for Pacquiao. Yes, Peterson beat Amir Khan in his best career performance, and yet still in controversial fashion, but Manny Pacquiao is not Amir Khan. Manny will not fight on the back foot and run around the ring picking shots. Manny will stand and brawl, which is what he is known for and what he does best. Is there anybody out there that can really see the light-hitting Lamont Peterson, who is notoriously known to be a slow starter and has been dropped quite a few times, surviving with Pacquiao after barely winning the fight against Khan by sheer pressure combined with two points deductions? Truth be told, Peterson would more than likely lose a rematch with Khan if it's held on neutral grounds. If Peterson were able to pull off another victory in a rematch with Khan, then maybe, just maybe the opportunity may be there for him to beat Pacquiao, but even then I would still prefer him to take on Ortiz again first since he feels he was short changed in that fight. Whilst I credit Peterson for a game plan that was very successful against Khan, and he may point to his performance against Ortiz as proof he can survive with a powerful, quick brawler, let's assess this correctly. Manny is not as naive as Ortiz, and has better heart. Plus, Ortiz fighting at 140 did not have anywhere near as much power as Manny Pacquiao possesses. Peterson's profile has risen since his victory over Khan, but let's not forget how easy of a time Timothy Bradley had with him, winning virtually every round on all three scorecards. Forget about fighting Floyd Mayweather's leftovers. Can Pacquiao truly afford to fight Timothy Bradley's leftovers? Personally, I do not see this fight doing anywhere near the numbers that Marquez or Cotto would bring to the table. I would be extremely disappointed to see Pacquiao fight Peterson, but it would not surprise me. Whilst all four options present a likely possibility, the only fight I would hope to see is Pacquiao vs. Cotto 2. The Marquez rivalry is only intriguing for the wrong reason; the controversy. The Cotto fight, however, ticks all the boxes. Cotto would be out for revenge from the first fight, when he was clearly a totally different fighter, drained both physically and emotionally due to the effects that still lingered from the loss to Margarito. A couple of years down the line, Cotto now seems to be a changed man in his approach, and the fight would add an interesting sub plot, with the obvious frustration Cotto is feeling with Top Rank and the way they have handled his fight negotiations in the past. However, that same notion could prove to be a stumbling block, as there may be a big difference of opinions on Cotto's purse if Top Rank is trying to keep him on board. It will be interesting to see if Bob Arum will risk lower pay-per-view numbers by pitting Pacquiao against unknown commodities like Peterson and Bradley, or if he'll push for the the more recognized names in Cotto and Marquez. No matter how you look at it, there's risk involved in all four names. As a fight fan, which one do you prefer? Feel free to let me know your choice by sending me an email at ssmith@fighthype.com. You can also follow me on twitter @scottsfighthype.